MURREE (92 News) – Snowfall continued in Murree, Galiyat, Abbottabad, Gilgit-Baltistan and adjoining areas, dropping down the mercury considerably. Owing to snowfall, people were restricted to their homes. Snow created difficulties for local residents, especially those residing in rural areas. Roads were also blocked after snowfall blanketed the Abbottabad and Muzaffarabad. Long queues of vehicles were seen due to blockage of all routes to Murree by police. People, especially women and children are facing hardships in the biting cold as their vehicles remained stuck for hours. Tourists said that the local administration is taking no step to clear roads blocked after the snowfall. “We are clearing roads on self-help basis,” he said. Snow-covered mountains are giving a beautiful look. 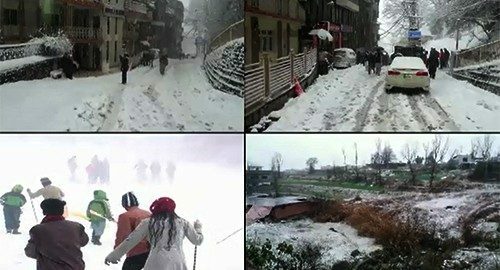 People enjoyed snowfall on the Mall Road and Kashmir Point. Meanwhile, Kalam, Malam Jabba and Shangla also received the snowfall.